The Supreme Court of California convened in the courtroom of the Marathon Plaza Building, 303 Second Street, South Tower, 4th Floor, San Francisco, California, on May 7, 1997, at 9:00 a.m.
Officers present: Robert F. Wandruff, Clerk; George Rodgers, Walter Grabowski and Harry Kinney, Bailiffs. CHIEF JUSTICE GEORGE: Good morning. We meet this morning to honor Justice Allen E. Broussard, who served with great distinction as an Associate Justice of this court from July 1981, through August 1991. I would first like to introduce the members of the court. Starting at my far left, Justice Brown, Justice Werdegar, and Justice Kennard. To my immediate right is Justice Mosk and to his right is Justice Baxter and then Justice Chin. On behalf of the court, I wish to welcome Justice Broussard’s wife, Odessa, his sons, his sister, and other friends. I did not have the honor of serving with Justice Broussard during his tenure on the Supreme Court. In fact, I was appointed to fill the position vacated by him upon his retirement. I did, however, have the great pleasure and honor of knowing Justice Broussard for many years. My appointment to the Supreme Court, 10 years after his, echoed my service as President of the California Judges Association, 10 years after his in 1972. Throughout his tenure on the bench, he displayed a dedication to the judicial branch and to improving and enhancing its service to the people of California. Justice Broussard’s departure from the Supreme Court can hardly be described as retirement. He did not even pause to slow down. Instead, he continued to serve his community, the legal system, and the courts on a number of fronts. One role, in particular, kept him in contact with the Supreme Court and the judicial council — his position as co-chair of the Judicial Council’s Committee on Race and Ethnic Bias in the Courts. As a member of the Judicial Council, while serving as an Associate Justice, and as Chair of the council after becoming Chief Justice, I was very grateful for his hard work and invaluable contributions in this important role. Justice Broussard’s contributions to the law live on in other ways as well. He will continue to be remembered not only for his intelligent and well-reasoned opinions, but also in the hearts and lives of the many young lawyers who worked with him and whom he continued to mentor long after they and he had left the court. It is now my pleasure to introduce Associate Justice Joyce Kennard, who will speak on behalf of our court. JUSTICE KENNARD: Thank you, Chief Justice George, for inviting me to offer some brief remarks in memory of Justice Allen Broussard, whose legal scholarship and dedication to the cause of justice graced this court for 10 years until his retirement in 1991. Last November, at the age of 67, in the rich evening of his life, Justice Broussard succumbed to cancer, which struck suddenly and swiftly. His sudden passing has left a pain, a void. Never again will we hear his laughter, never again will we hear his voice. But we will always have the memories, fond and precious memories. 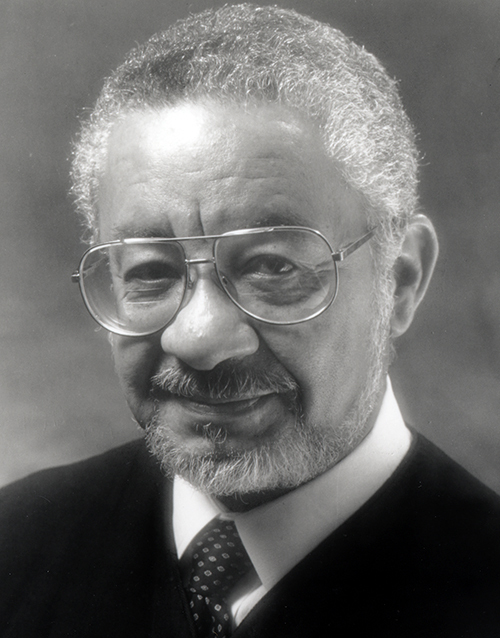 Through these memories, the flame of Allen Broussard’s spirit will burn eternally, reminding generations to come of the great legacy left by this great jurist and great man, the second African-American justice to serve on the California Supreme Court. In the words of Samuel Butler, “To die completely, a person must . . . be forgotten, and he who is not forgotten is not dead.” Allen Broussard will never be forgotten. His penetrating legal analysis will continue to offer us wise counsel through the many opinions he authored for the court. And the deep humanity that Allen brought to every endeavor will also live on. From humble beginnings, Allen Broussard rose to high office. He was born on April 13, 1929, in Lake Charles, Louisiana. In 1945, when Allen was 16, he and his family moved to California, in search of greater opportunity. His father worked as a longshoreman, and his mother as a seamstress. Young Allen had part-time jobs ranging from shoe selling to canning to help pay for his education, first at San Francisco City College, then UC Berkeley, and later Boalt Hall School of Law. Allen never forgot his roots. Even at the height of his career, he remained down to earth, always mindful of the plight of the poor, the weak, the disadvantaged. Through his compassion, kindness and generosity, he touched the lives of many, many people. Those lucky enough to know him well undoubtedly shared a bowl of gumbo with him. As I found out at the memorial service for Allen last November, no reminiscence, no memory of him is complete without a gumbo story. This morning, I have such a story to tell. Without doubt, this is the first time that the proceedings before this court pertain to the issue of gumbo, Louisiana Broussard gumbo to be precise. Up there, Alle must be chuckling. Allen’s mastery of gumbo cooking is legendary. But I did not know that when I came to the court in April 1989. A few months after my arrival, Elliott Williams, the court’s first African-American bailiff, who is now retired, did something very nice for me: he made a huge pot of homemade gumbo and brought it into my chambers, enough to feed two dozen people. When Allen stopped by for a taste, and I raved over Elliott’s gumbo, Allen said only, “Wait till you taste mine.” He then left. The Broussard gumbo day came shortly after the October 1989 earthquake, which severely damaged our court building in the Civic Center. Allen invited Elliott and me into his makeshift chambers, where the desk was laid out with china, silver, and linen napkins. Anyone else would have simply provided Styrofoam bowls, paper napkins, and plastic utensils. But Allen always did things his way, with class. Those of you who knew Allen well know that he liked his food hot, very hot. He encouraged Elliott and me to generously use some special Louisiana Broussard seasoning. We did, and soon reached for water to quench the fire within us. But the gumbo was indeed most delicious. Allen had made his point: he was a gumbo master chef. Through this brief remembrance I have tried to recapture a wee bit of the spirit of Allen Broussard, a man of extraordinary kindness, thoughtfulness, generosity, and warmth. In a word, he had soul. This is what drew people to him, as exemplified by the more than 1000 persons who attended his memorial service at the Paramount Theatre in Oakland. We came to say good-bye to a splendid man, whose brilliance and sensitivity as a jurist added lustre to this court. It was an honor to have been his friend and colleague. CHIEF JUSTICE GEORGE: Thank you very much, Justice Kennard. It is now my pleasure to introduce retired Court of Appeal Justice Harry Low, who was a long-time friend of Justice Broussard. The two of them served together on many committees designed to improve the administration of justice in our state. JUSTICE LOW: Mr. Chief Justice Ronald M. George, distinguished Associate Justices of the Supreme Court, Mrs. Odessa Broussard, Keith, Craig, family, friends and colleagues of Justice Allen Broussard. Allen Broussard’s distinguished legal career spanned more than 40 years. He served 10 years as an Associate Justice of this Supreme Court, from 1981 to 1991. He liked to refer to himself as a “triple Brownie”–appointed to the Oakland-Piedmont Municipal Court by Governor Pat Brown in 1964, elevated to the Alameda County Superior Court in 1975 by Governor Jerry Brown and then appointed to the California Supreme Court in 1981 by Governor Jerry Brown. I met Allen when I entered law school in 1952. Allen was a third year student, vice-president of the Boalt Hall Law Students Association and one of the few minority students at Boalt. He was a member of the editorial staff of the California Law Review and his scholarship and activities got just about every students’ attention. He was the first African-American at Boalt ever admitted to the Phi Alpha Delta law fraternity and his membership almost caused the local PAD chapter to be removed from the then-antiquated national organization. A1 Broussard and the Boalt chapter took a principled stand and successfully challenged the national law fraternity. Right away, I knew he was the kind of person I could learn from; and I did for the next 40-plus years. After graduation in 1953 and a two-year service in the United States Army, Allen served as the research attorney for Presiding Justice Raymond Peters. It was there that he first enjoyed the accommodations of the fourth floor of the State Building at 350 McAllister Street. He saw the work of trial and appellate judges, and probably concluded, “I could do that.” Indeed he could and he did it very well. He practiced law for the next eight years in partnership with outstanding practioners such as Clinton White, Lionel Wilson, Wilmont Sweeney and Carl Metoyer. Justice White and Judges Wilson and Sweeney are respected jurists and Lionel Wilson was later Mayor of Oakland. Carl Metoyer is a highly regarded lawyer in Oakland. One can imagine the pleasures he shared in the practice of law with such fine colleagues, not just as professionals in the law, but as persons who were very active in the civic life of the Bay Area. The late 1950’s and early ’60’s were also a time when politics was fun–and his firm took an active part. In 1956, Allen was chairman of a civic organization–Men of Tomorrow–and he wanted publicity for this new group. He called on the program director of radio station KSAN and charmed her into giving free air time to his budding group. Always the flirt, Allen won a date with Odessa, the program director. Allen married the love of his life, Odessa, in 1959. He became the proud father of their sons Keith and Craig, both graduates of the University of California. Odessa was the ideal wife, compassionate, supportive, understanding; she was also always a reality check on Allen’s more idealistic pursuits. Allen was always deeply committed to his family and participated in the education and the outside activities of his boys, biking, music, school projects, and everything else. Then he would do a typical Allen Broussard thing, decide to leave mom home, take a few days off with the boys and hit every big roller coaster ride in the state. Allen was also the son who was close to his parents and very supportive of his brother and sister. At every chance he would give credit for his success to his father Clemire and mother Eugenia Broussard. It is quite natural that Allen was very close to his sons. Son Keith has developed software at Hewlett-Packard for the last 10 years. Keith also produces training films for H-P staff and teaches fellow employees all around the world. Son Craig is a creative city planner, musician and artist, who is on the staff of the Oakland City Planning Department. Almost from the start of Allen’s judicial career, he was active in judicial education and was a popular lecturer and panelist at judicial conferences. In 1972 he was the first African-American to be elected President of the California Judges Association and later became Chairman of the Board of the Center for Judicial Education and Research. He also served on the California Commission on Judicial Performance, the California Judicial Council, and the Board of Governors of the National Judicial College in Reno, Nevada, and is one of the founders of the Charles Houston Bar Association, in which he remained active throughout his career. Allen went on to take an active role in the American Bar Association and was the Chair of the Judicial Administration Division’s Taskforce on Opportunities for Minorities in the Profession. We would chuckle over our involvement in the ABA, because when Allen graduated from law school in 1953, the ABA still had a policy limiting or refusing admission to minorities. But Allen never dwelled on the past or on things negative. In the 1980’s he saw how important it was for minorities to be active in the legal profession and to participate in a national organization. Allen devoted a great deal of time to the ABA. Justice Broussard truly enjoyed being a judge and was proud of the judiciary. He enjoyed working with people and probably held more staff meetings than most other justices. He joked with the clerks, the secretaries and others in the courthouse. Allen felt a duty to be a teacher to his externs and research attorneys; he also had more externs than other justices, sometimes as many as six at any given time, and was a role model, especially for minority law students. Allen shared his Lake Charles, Louisana hospitality with staff at parties in his home where he cooked the Cajun gumbo for which he was famous, claiming his spicy gumbo brought out the best in his staff. Allen Broussard brought out the best in everyone. His chambers were an open door to anyone, even the staff of other justices. He acted like a “judicial therapist” where you could get a happy thought and a good legal opinion in one session. Everyone who has worked with Allen would describe him as a nice person, always a gentleman–an intelligent diplomat. Allen was probably an ideal justice for the California Supreme Court during the 1980’s when the Supreme Court was in transition. For the first five years he was a close associate to Chief Justice Rose Bird and helped in the management of the California judiciary. He wrote many of the majority opinions for the court. In 1987 when the Supreme Court added three new members and was led by Chief Justice Malcolm Lucas, Allen Broussard often wrote dissenting opinions; but he was always the diplomat, he was never derogatory. He maintained his ideals yet kept a friendly, collegial relationship with all the members of the court. Of course the test of calm leadership is how one responds in a crisis. When the Loma Prieta earthquake in 1989 shook the old State Building on McAllister Street, Allen was meeting with his staff. His office was decorated with African sculptures, shields and spears. When Allen dove under his desk, most of his staff followed. They squeezed into that tiny knee space and under the tables. The African spears and art fell about them, adding to the chaos. Allen passed the test. He got his staff out of the building and on their way home. But, he later admitted, he was one frightened judge. Throughout Allen’s judicial career, he maintained an active role in the community. He had served on hospital boards, the East Bay Community Foundation Board, Big Brothers, Council for Civic Unity, the United Nations Association and numerous other civic and charitable bodies. When he retired from the Supreme Court in 1991, it was quite natural that he would agree to serve on the Oakland Port Commission, to chair the Union Bank of California’s Community Policy Advisory Board, and would continue to serve Boalt Hall and the California and federal judicial system in a variety of roles. He continued to collect honors from his law school, his university, the legal profession, the community, thoroughly enjoying them all. After he left the judiciary, Allen accepted the position on the Oakland Port Commission and part of the attraction was his opportunity to call on ports around the world, especially those in Asia. In 1987, Allen and Odessa, led a group of 72 judges, lawyers, former legislators and city officials on a 3-week tour of China. In 1987 China was still used to having orderly delegations with the head of the delegation leading the group. But with this mix of independent personalties, it would be hard to keep a regimented group. Allen knew it was best to just let everyone have a good time. It was one of the best trips I even have taken because Allen set the pace. He was a judicial statesman when it was called for, a consumer of great banquets at every occasion, a good dancer and always a lively conversationalist and gracious guest. Because of our ties to the San Francisco Bay Area, several of us spent time with Mayor Jiang Zemen, then Mayor of Shanghai, a sister city to San Francisco. Allen struck a friendship immediately. We have maintained some contact with the former mayor, who is now the President of China. I think that Allen might have been appointed to be on China’s Supreme Court had he wanted–or at least on the Shanghai or Beijing Port Commission! The trip opened Allen’s appetite for travel and expanded his desire to learn of other cultures and countries. Seeing China was an opportunity to see an ancient civilization trying to modernize; in 1987 change was everywhere and he commented on the contrasts in the economy, the government and the different social system. He was fascinated and we all had a good time. After his “retirement,” Allen maintained an active practice with Coblentz, Cahen, McCabe and Breyer and with the American Arbitration Association. Always looking ahead and seeing how he might make things better, just before he got very sick, he was telling me how as Chairman of the Community Policy Advisory Board of Union Bank of California, we could help reshape the banking and financia world to better serve the underserved. Allen Broussard will be best remembered for the enthusiasm and enjoyment of everything he did. He made friends quickly; even those who were with him only a brief period of time, especially his clerk-interns, were among his most loyal admirers. He was an inspiration to all those who worked with him. His kindness and genuine honesty made him a valued addition to any office or committee. One of his partners at the Coblentz firm where Allen spent his final days in the law profession said it well: “Allen’s biggest contribution to the firm was simply, himself. As in every other facet of his life, Allen always reached out to help, to comfort, to listen or to share a laugh with us. We remember him for his humanity, his fairness, his wit and his unflagging optimism.” So do we all remember Allen. That Allen left us at the early age of 67 is cause for mourning, but his having been our friend is indeed a cause for rejoicing. Thank you Allen. CHIEF JUSTICE GEORGE: Thank you very much, Justice Low. I would now like to introduce Mr. Robert Harris, a long-time friend and colleague on the Port Commission. Today is especially important to me because it presents an opportunity to comment on a mentor, a friend, and a statesman. In my lifetime, I have had the honor of knowing many great persons, but I can think of no person greater to have known than Justice Allen E. Broussard. Allen had a profound and lasting impact not just on me, but on countless men and women throughout this nation. He was unique in many ways. A courageous, self-made man, Allen struggled for every inch of each milestone of his illustrious career. Yet, he never once forgot neither his roots nor those who pushed him toward greatness. Too frequently there is a tendency on the part of some people to deny their heritage and ignore their background. With Al, this was not the case. He was very proud of his heritage and background. More importantly, he seized every possible opportunity to reach back to help others. His commitment to the NAACP, the Mentor Center, and many other groups earned him the respect of the entire community. In other words, he gave of himself unconditionally. As a young lawyer, I had the opportunity of meeting Al over 25 years ago. His commitment to, and interest in, the growth and development of African-Americans in the legal profession was legendary. He always took time to counsel and guide us even when we didn’t solicit his counsel or guidance. A strong supporter of the Charles Houston Bar Association from its inception in 1955, Al, until his untimely death, remained an active and visible member as he climbed the judicial ladder. His mere presence, with his usual gracious manner, served to motivate and inspire members of the Charles Houston Bar Association. He was inducted into the Charles Houston Bar’s Hall of Fame. Around the nation, especially as a member of the Judicial Council of the National Bar Association, Al touched the lives of many lawyers and judges. He was the consummate role model. He inspired and motivated others to search for greatness and justice. When he spoke, silence encircled the audience, which cherished each word he spoke. For those of us from the Bay Area who have served as presidents of the National Bar Association, we owe a special debt of gratitude to Justice Broussard. Tom Broome, Jim Cole and I, as past presidents of the National Bar Association, know full well that were it not for giants like Al, who were willing to embrace us, we would not have been elected to lead the National Bar Association. On a personal level, let me say that both Al and Odessa have been dear and personal friends to me. Odessa, in particular, must be commended for her willingness to share Al’s time with others. I know that such sharing reduced the time available for Al to be with his beloved family. Clearly, it decreased his available time to spend with his sons Keith and Craig. For this sharing, we remain forever indebted not only to Odessa, but also to Craig and Keith. I knew Allen in many different roles and in each he was the epitome of excellence. As my brother in Sigma Pi Phi Fraternity, he not only sponsored me into the fraternity, but gave me and others sage advice on many different issues. His leadership in the fraternity was bold and decisive both locally and nationally. At the time of his death, he was national chair of the Constitution and By-Laws Committee of the fraternity. Whenever and wherever duty beckoned, Al was simply incapable of saying no. Such was the case when he received a telephone call from Oakland Mayor Elihu Harris asking him to serve as a commissioner of the Port of Oakland. Predictably, Al accepted and, of course, rapidly distinguished himself as a leader of the Board of Port Commissioners, and was elected last July as President of the Board. Today, I am fortunate to have been selected to serve out the remainder of Allen’s term on the Port Commission. My fellow Oakland Port Commissioners, the Port staff and I marvel at the outstanding contributions Allen made to the Port of Oakland. His commitment, dedication, acumen and capable leadership enhanced the Port’s mission. Finally, today we celebrate the life of a unique individual. We celebrate the life of a man who understood that justice does not automatically shine on all people, but rather must be carefully focused into those dark corners where it rarely shines. CHIEF JUSTICE GEORGE: Thank you very much, Mr. Harris. I want to thank again all those who have contributed their special and memorable remarks to this morning’s memorial session. In accordance with our custom, it is ordered that this memorial be spread in full upon the minutes of the Supreme Court and published in the Official Reports of the opinions of this court, and that a copy of these proceedings be sent to Mrs. Broussard.